Welcome to Kings Creek Station. Right on our doorstep lays Australia’s Spectacular Central Ranges covering an area of 168,000 km². This vast maze of crags and canyons, caves, rock formations and waterholes, craters and many more natural features are accessible only from the air. Climb up to the top of George Gill Range to view Bagot Spring, the Central Ranges Panorama and, weather permitting, spot Ayers Rock, The Olgas and Mt Connor on the horizon. On the way back down get a great aerial perspective of Kings Creek Station and its campground. Fly through Petermann Pound and along the top of George Gill Range to spectacular Kings Canyon. View the Lost City, the Garden of Eden and the path of the rim walk. On your return journey you will see Reedy Gorge, Lila Aboriginal Community, Kathleen Springs, Stokes Bluff and weather permitting, spot Ayers Rock, The Olgas and Mt Connor on the horizon. A highly recommended upgrade from our Kings Canyon Flight taking in Carmichael Crag at the end of the Range. Just over the George Gill Range is one of the most spectacular views in Central Australia. Sit back and take in the breathtaking views only seen from the air. See the beautiful Ferrar Springs, unexplored caves, rock formations and waterholes. Search the area for wild camels and horses. Marvel at the beauty and ruggedness of the distant landscape – remote, secluded and absolutely spectacular. This is one of our favourite flights. This flight covers some of the most amazing scenery the Northern Territory has to offer. Fly out over Kings Creek Station and along the George Gill range for a birds eye view of the spectacular Kings Canyon, then head out into the remote wilderness of Shake’s Plain, Middle Range and beyond, searching for wildlife and some of the hidden wonders this extended flight makes possible. Ask our pilots about the chance to fly along Parkes Creek – It’s their all-time favourite flight. 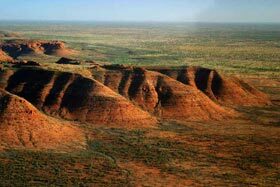 Exclusive charter to Gosse Bluff, Palm Valley, MacDonnell Ranges, Lake Amadeus, Alice Springs, Ayers Rock, The Olgas and Mt Connor or any other destination you require. Your helicopter, your choice. Ask for a price. * Bookings can be made directly with our pilots, through reception, your tour guide or travel agent. Minimum passenger numbers of 2 pax are required for all flight bookings to be confirmed. Individuals wishing to book in advance can only be processed as standby and will be allocated a seat as one becomes available within their set time frame. Seating of standby bookings cannot be guaranteed. Passengers over 90 kg are requested to advise the tour operator of their actual weight when making a booking. 24 hour notice required for refund. All flights are subject to pilot’s discretion, weather conditions and aircraft availability. All routes are constant. Flight times may vary according to helicopter type, number of passengers and / or weather conditions. All flights are covered by airline passenger seat insurance. Flights operate daily from sunrise to sunset on demand from Kings Creek Station Heli Pad. Ayers Rock Helicopters and Kings Creek Helicopters are divisions of Choppair Helicopters Pty Ltd – ABN 82 087 863 723. Prices are valid 1 April 2011 – 31 March 2014. Tour Agents please contact Ayers Rock Helicopters directly for rates. All Prices are in Australian dollars, includes GST and supersedes all prices previously advertised. Click here to go to the Kings Creek Station website.